There’s nothing more frustrating than having information buried in your software system that you can’t get your hands on. Your staff begin to view it like a “black hole” once information goes in, it never comes out! Worse still, without the proper cloud-based reporting software, all that unstructured data your business has worked so hard to collate, remains just that……unstructured and of little use. Unfortunately, time and time again businesses find themselves in exactly this situation. That’s why when searching for cloud-based software solutions companies need to make sure that the information captured can be just as easily accessed for practical business reporting. FIELDFIX provides a wide range of reporting options across our entire feature set. For example FIELDFIX Job Management compiles all job related data into one easy to view screen. See costs vs revenue per job, per contract or per client from anywhere, any time and stay on top of your business the easy way. Audit, Health & Safety, Compliance Reporting – use FIELDFIX’s smart Event Management reporting feature which merges information with photographic evidence instantly. FIELDFIX Event Management is brilliant for capturing all those ad hoc events as they happen in the field. 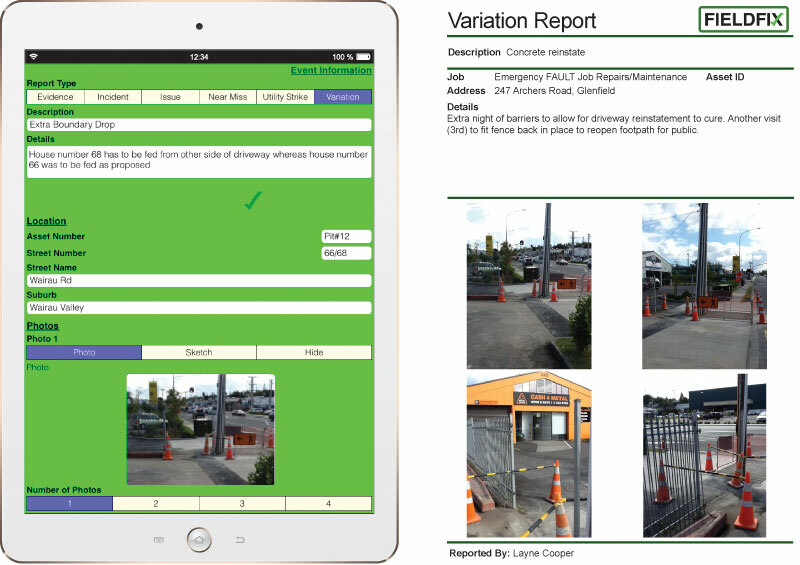 Field crew record incidents with multiple photos and text, all information is merged into professional reports in seconds allowing you to stay ahead of the game and ensure your clients get all the information they require. In addition to our core reporting feature set many customers have their own reporting requirements. With the FIELDFIX custom fields feature, custom reporting is easy, without the usual burden of expensive development costs and long lead time. Just tell us what you need and we’ll do it. So if you are struggling to get the information you need from the field and back to the office in real time, and you want a smart software system that knows how to store, access and utilise data, the FIELDFIX team would love to hear from you. At the end of the day, gaining information is only a small part of the process. Making sense of your information with intelligent business reporting is critical to the success or failure of your business.